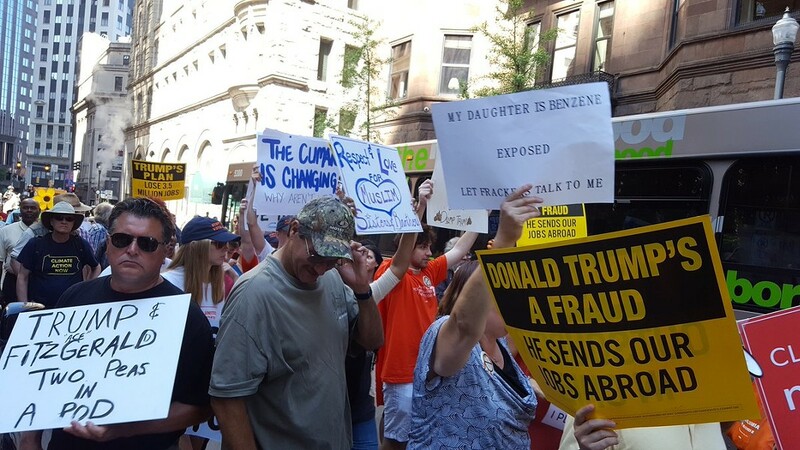 While protests today started off small and peaceful, a final demonstration outside of Trump’s political fundraiser at the Duquesne Club resulted in a larger, louder finish. 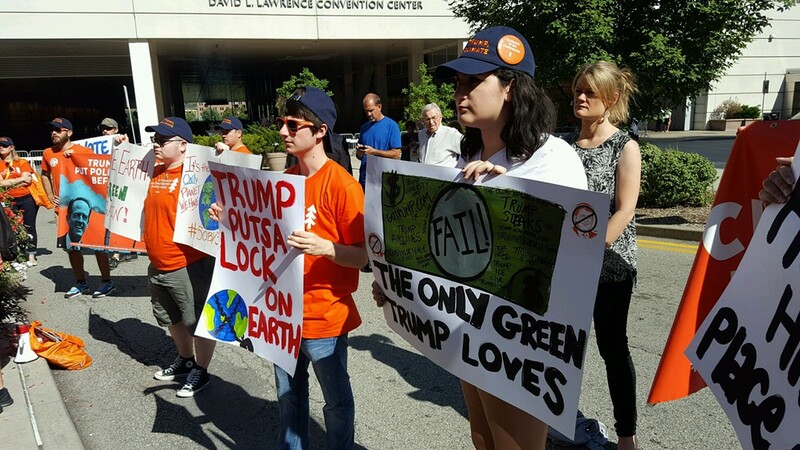 Earlier today, a variety of social- and environmental-justice groups held a peaceful rally outside of the David L. Lawrence Convention Center where Trump was the keynote speaker at the Shale Insight 2016 natural gas conference. “[Trump is] winning,” said hip-hop artist Blak Rapp Madusa. “That goes to show you ignorance is being repeated. It’s being passed on. How could you support such deliberate hate. 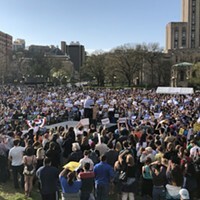 Many from this rally later joined other activists to form one massive demonstration that saw more than one hundred protesters taking to the streets of Downtown Pittsburgh to block traffic. The group staged a sit-in at the corner of Wood and Sixth streets before moving down the street to form a blockade around the Duquesne Club. After reaching the Duquesne Club, several protesters attempted to enter the building through a revolving door before they were pushed back by police on horseback and other officers in riot gear. One man was arrested. A Yahoo News National Correspondent has posted the portion of Trump's speech talking about the Charlotte Protests. 31-year-old Alex Cromer came to the protest this afternoon to contribute to the cause the only way he knows how: art. 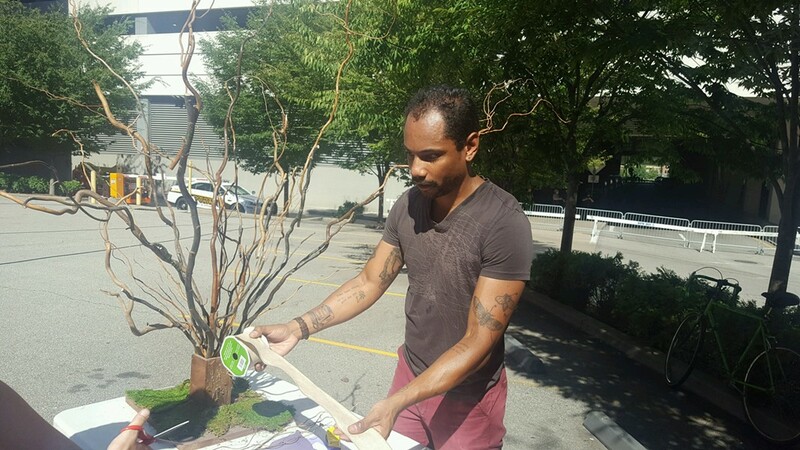 He's inviting people to contribute to his art project by writing poems on leaves to add to the tree he's been building on site. "No words of hate, only love," Cromer says. "We need to care. We live on this earth. I'm an artist so I figured this is how I can contribute most effectively." Watching on the live stream: Speaking about the police protests in Charlotte, Trump says that violent protests aren't the answer and says it's not fair to all of the "law abiding African Americans." Sounds like a 2016 version of former Gov. EvanMecham's comments years ago about the "good blacks." News Editor Rebecca Addison reports that about 100 protesters are gathered outside of the convention center, a much smaller crowd than Trump's previous visits. 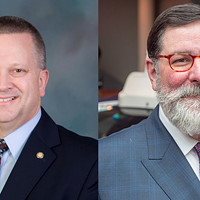 We wonder if Clinton supporter and Allegheny County Chief Executive Rich Fitzgerald knows about this. (FYI, it's the Airport Authority's fire Department. Republican presidential nominee Donald Trump is in Pittsburgh today and so are the protesters. Trump will be at the David Lawrence Convention Center today to speak at Shale Insight 2016, a conference focused on the development of the Marcellus Shale natural gas industry. 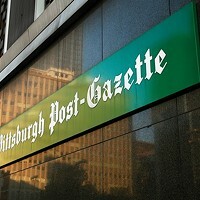 Later in the day, he'll be at the Duquesne Club. Downtown for a political fundraiser. A number of organizations will be protesting at events outside of Trump's stops including One Pittsburgh, NextGen Climate PA, Clean Air Moms Action and 1Hood. They will also be joined by local politicians and labor organizations. In a statement released yesterday the International Union of Operating Engineers Local 66 announced they were ending their support of the Shale Insight conference because of Trump's selection as the keynote speaker. Trump's appearance at the conference in Pittsburgh this week coincides with national outrage over the 1,172-mile Dakota Access Pipeline, which would transports 500,000 barrels of fracked crude oil daily from North Dakota to Illinois. . Last week protesters blocked Liberty Avenue in Downtown Pittsburgh. Stay tuned for our coverage throughout the day.